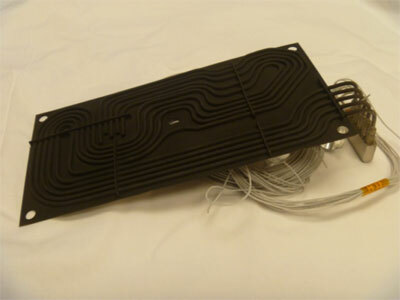 Peregrine, in collaboration with its Aerospace customer, undertook a design, manufacture and testing contract to produce a set of shunt resistor bank heater plates for a satellite application. 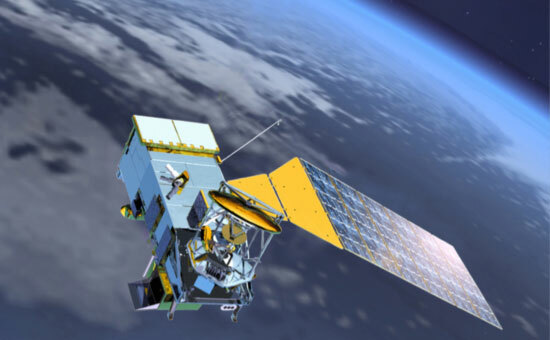 Specific to this application, is the requirement to dissipate 900 Watts of thermal energy into space. Due to the environment of space, this thermal load had to be transferred by radiation into space. 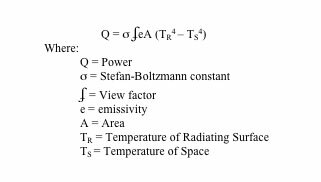 Based upon the above equation, Peregrine determined that four heater plates with a surface area of approximately 50 in2 each would be necessary in order to dissipate the 900 Watts of thermal energy. Peregrine modeled, analyzed and produced initial SRB plates in order to validate the design. Through the course of manufacturing, the cable heaters had to be precision formed, metallurgical joined to the carrier plate, and then the emittance surface was coated with thermal coating in order to achieve its proper finish. 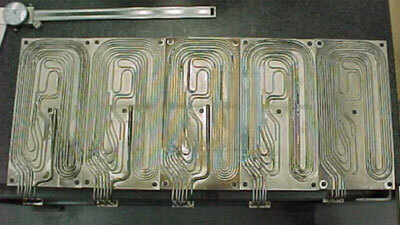 The cable heaters were terminated along one edge of the heater plate. At this location, lead wires were attached, the cable heater ends were glassed in order to seal against moisture contamination, housing was added and the final overall contact area was potted for strain relief. 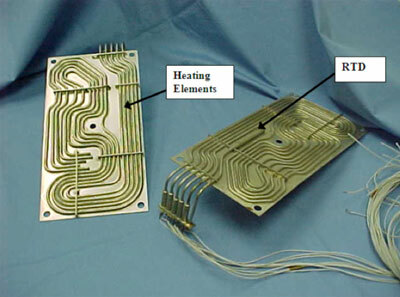 Each set of heater wires within the cable heater located on the SRB plate was electrically isolated from the plate. Each plate had the potential of dissipating 225 Watts of thermal energy. A bank of four plates equated to the 900 Watt goal.